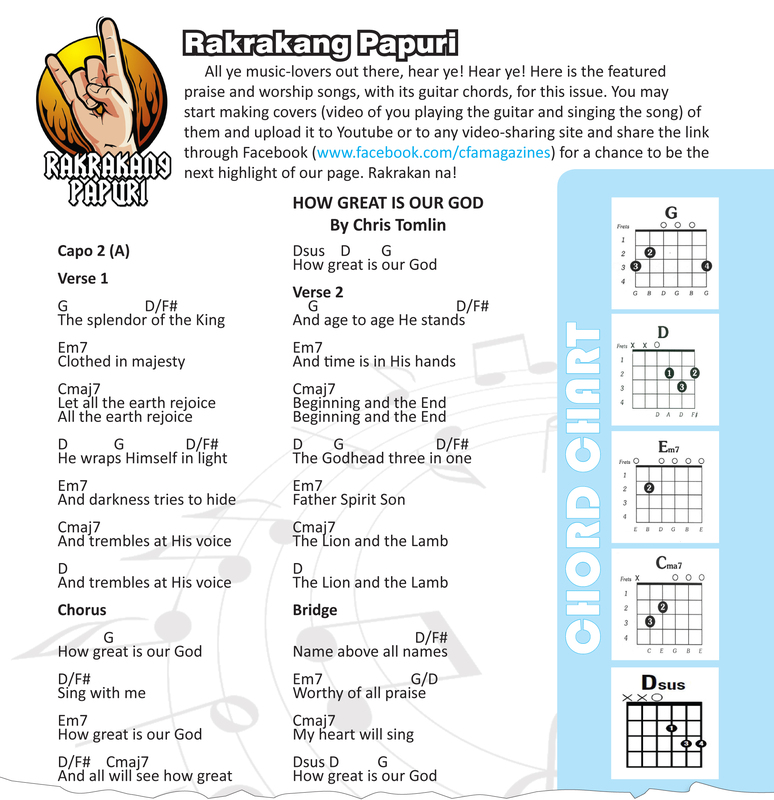 In this month’s issue of the Gospel Komiks and Gospel K Magazine’s Rakrakang Papuri we challenged our readers to make their own cover of the song “How Great is Our God” by Chris Tomlin. Two grade 9 students namely Danna Jean dela Cruz Udan and Divine Joy Cordon Pili from Saint Vincent School, Maddela, Quirino accepted and uploaded their video on YouTube. You can watch their performance through the embedded YouTube video above. We at CFA thanks Danna Jean and Divine Joy for their excellent rendition of the song. Finally after months of deliberation and online voting, CFA will declare the winners of the Awit ng mga Bagong Bida 2: Music Video Making Contest. The top 10 finalists coming from different schools nationwide will be presented here live at Communication Foundation for Asia grounds on March 7, 2014 (Friday). 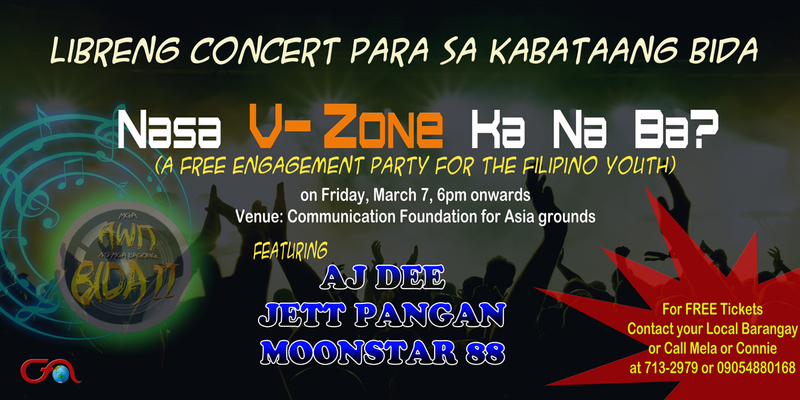 Dubbed “Nasa V-Zone Ka Na Ba” A Free Engagement Party for the Youth, the event is open for all interested participants especially the youth. The free concert aims to inspire volunteerism among the youth and promote the importance of good governance, both which are highly relevant to the current issues our nation is facing. For Free tickets, call 7132979 or 09054880168 and look for Mela or Connie. Here are the top 10 finalist listed in no particular order. Culminating the concert are Moonstar88, the band made famous by chart topping hits like “Torete”, “Sulat” and “Migraine”, and Jett Pangan one of the country’s well known musician. Hosting the event is Actor and Host AJ Dee. Good luck to all the entries and See You this March 7. Awit ng Bagong Bida 2: Top Ten Entries Revealed! The top 10 entries for the Awit ng Bagong Bida 2 contest are finally revealed! Over the course of a month the judges have finally picked the top 10 entries among the 25 music video entries submitted. All entries are original compositions and music videos created by the Filipino youth from all over the country. Facebook and Twitter pages have been set up to feature the contestants creativity and passion for engaged citizenship and promotion of good governance through video and music, the youth’s most favored language of expression. Congratulations to all the qualified entries who made it to the top 10! They are listed in no particular order. Online voting is now officially open. Click here to view and vote! Forty percent (40%) of the final score given to the entries will be based from the online vote so be sure to vote the MTV that inspires you to become an engaged citizen and work for good governance. The three highest overall scores will be named winners. The overall Champion will receive P 30,000 while the 2nd and 3rd prize winners will receive P 20,000 and P 10,000 respectively. Best of luck to the top 10! Awit ng mga Bagong Bida 2 Facebook page launched! 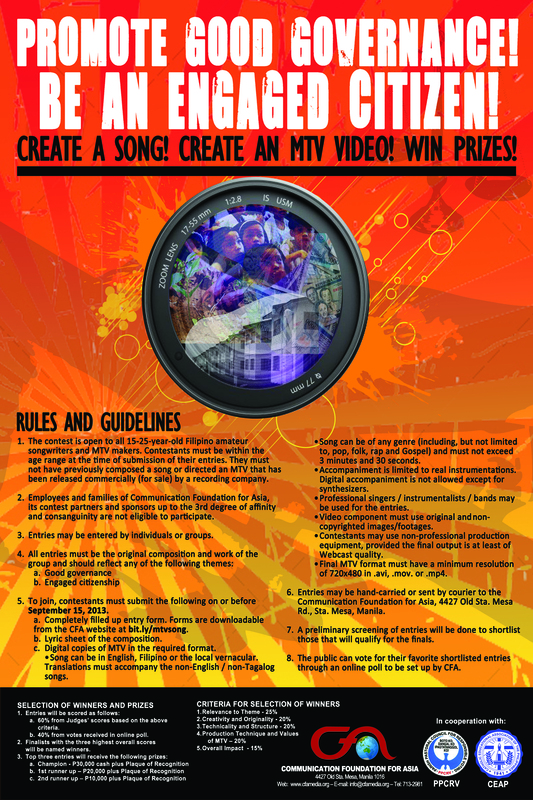 All entries for the CFA MTV contest “Awit ng mga Bagong Bida 2” are finally in! With this comes the launch of its own Facebook page. The contest was launched last November 2012 by the Communication Foundation for Asia in cooperation with The Parish Pastoral Council for Responsible Voting (PPCRV) and The Catholic Educational Association of the Philippines (CEAP). Aimed to set an example of pro-activeness among the Filipino youth on the social issues of our country, it’s main themes are promoting good governance and engaged citizenship. The entries came from all over the country mostly from students. Like the Facebook page to get the latest updates from the contest. All 25 entries have been posted on the page. Feel free to like the videos you want and post your pick of who do you think deserves to be the overall champion.